As part of the construction methods for most buildings, you will find that a significant amount of concrete is used. This means when it comes to making openings for doors and windows, preparing for the installation of utilities, or to also cut masonry, tiles, stone or any other hard surfaces, it is essential that you have a variety of concrete sawing techniques at your disposal that allows for the precise cutting of these different surfaces. As equipment becomes technologically more efficient, it allows for more accurate cutting which makes it easier for the installation of utilities, particularly when it comes to retrofitting an office for example. In days gone by, it was customary to leave openings in concrete by introducing formwork during casting, but these openings can move out of place causing problems during the alignment stage later on. It also requires very detailed planning of utility routes at the construction stage and doesn’t allow for any changes later. Concrete sawing techniques can either use dry or wet sawing. Dry sawing is used more in outdoor projects, as this process causes a large amount of dust. With this type of machinery, a vacuum arrangement helps to collect the dust and prevent it from spreading. Wet sawing helps to keep down the dust, a well as cooling the blade which can become easily heated because of the friction caused by the sawing movement against hard concrete. Not only can this help to extend the life of the blade, but it is also considered environmentally friendly, due to the reduction of dust, longer life of blades and lower noise levels. Most equipment used for the sawing of concrete runs on electrical power, though you may find some that run on diesel engines and are more useful for work in remote areas, where power can be a problem. The equipment normally uses rotating blades that have their edges made for cutting by either hardened surfaces or through impregnation with diamond, which is the hardest material known to man. Some saws will have also use wires that have similar diamond impregnation in the form of beads. These wires never produce any cracks on the surface being cut and are especially useful for the creation of large openings in concrete. 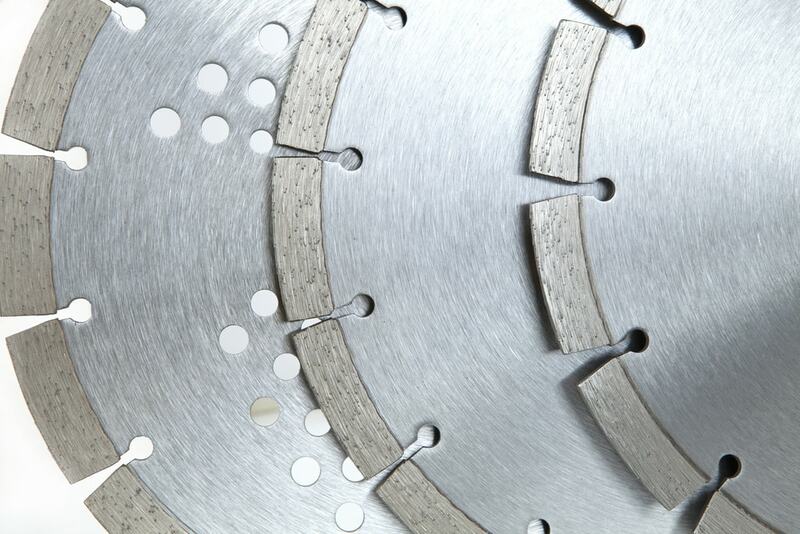 Ringsaw blades are in use in concrete cutting equipment that is handheld and these blades will use abrasives instead of teeth to do the cutting. There are all types of machines used for the cutting or sawing of concrete, and each one is different so the operator using it must be aware of the right way to use them so that accidents can be avoided. It is necessary to make a thorough inspection of the equipment before it is switched on and put to work. The steel core of the blade must be free of cracks, and any discoloring of the edges, like a bluish discoloration, for instance, can indicate that the blade became overheated and became oxidized earlier in its use. This can then result in failure of the blade. The width of the steel core must be even, as uneven width indicates undercutting. Blades must have the right orientation, and there should be no missing or cracked diamond segments. It is critical to use the right saw for the work being undertaken. Saws have a maximum safe rotational speed, and any saw that runs at a high speed can easily expose a defect. Protective gear is a must when using concrete sawing machinery. Use proper guides and marking to ensure you are making the right cuts. It’s important to raise the saw before you start the machine, and make sure you do this before you switch it off, otherwise the blade can get stuck in the cut and get damaged. Concrete saws must be allowed to run and cut using their own weight, and you more or less only need to steer the equipment to ensure that it is making the right cut. Make sure that you have a good water connection that you can hook up to the concrete saw, and also have proper drainage that allows the water to run away. Flooded areas become dangerous to work in when you are using equipment that is powered by electricity. It’s important to push the saws from behind and allow the blades to do their cutting without any putting any pressure on the machine. Make sure the blade guards are always in position when the machine is in operation. If you are looking to cut concrete, no matter how big or small the cut, you should always contact your local concrete cutting experts. You can’t beat experience as a teacher. Contact us today!